Also make sure to check out the Navak & Egregious Restoration Shaman Throughput and Efficiency Calculator! If you find yourself reading this guide then you are probably interested in or considering playing the Restoration Shaman. This will be a comprehensive, in-depth guide of what it means to play the Resto Shaman at a competent level in Classic WoW. Within will be discussed all aspects of the class, from totem usage to stat priority, in an effort to bring you up to speed on the ins-and-outs of this utility healer. … or just pick your favorite. Let’s begin with a solid spec. I will provide a visual and link for what is considered the standard PvE Resto specialization. If you are considering avoiding points in Healing Grace, I would heavily advise against it. Chain Heal generates a significant amount of threat–especially with full consumables. And if you find yourself in a melee group, you will usually not be able to drop Tranquil Air Totem, drastically increasing your risk of pulling aggro on trash or boss mobs. A dead Shaman is a worthless Shaman. I recommend switching 2 points into Improved Reincarnation during Naxxramas progression because of high wipe density and a short corpse run. To free up the 2 points, you can take them from Healing Focus or Ancestral Knowledge depending on your mana pool and consumable usage. A spec such as this allows utilizing Enhancing Totems as well as Guardian Totems, which makes you more lovable to your Melee DPSers and tanks. This spec is still PvE viable since you do not lose any direct healing throughput, only pushback reduction; although on fights with pushback you will be less likely to ignore the effect which could, in turn, generate a loss in overall healing. Caution! You will generate extreme aggro with this spec! Be very careful as you do not have any talents in Healing Grace! Personally, I have exploded onto the tanking scene during Broodlord, and several other pre-AQ40 bosses, even with 2/3 points in Healing Grace. You have been warned! Another possibility is to go into the Elemental tree and spend 8 points to pick up Elemental Warding for encounters where elemental resistances (Frost, Fire and Nature) are important. This spec could be particularly useful on fights such as: Vaelastrasz, Viscidus and Sapphiron. Proper itemization is one of the most vital aspects of WoW. Stats beneficial to the Resto Shaman are: MP5, Intellect, Healing Power, Spell Crit, Stamina and Spirit–often in that order. We will go into more depth on the respective benefits of these stats in the Stat Priority section below, but for now, the order listed above is a fair guideline to gearing throughout early Classic. When gearing up during the initial stages of Classic 5mans, it is important to prioritize mana stats (Int, MP5) over throughput stats (Healing Power, Spell Crit). Resto Shaman are sadly not very mana efficient during these early stages of play. With that in mind, I have gathered a pre-raid BiS list prior to MC. This list will not include gear from world bosses. Only gear obtainable off the AH, basic PvPing, world content and dungeon grinding (including Dire Maul) will be included in this pre-raid BiS list. This is a very even spread of stats and should keep you comfortable healing everything from dungeons to Zul’Gurub to Molten Core and on into Blackwing Lair. There are some alternatives listed above which exchange healing for MP5 or MP5 for healing, but, overall, the effect will be about the same. I advise you to get all of those pieces listed, as swapping gear out for more mana intensive encounters is a very smart move. The inverse is equally true; on fights that do not require as much MP5, a greater pool of Healing Power will be more beneficial. The rest comes down to your playstyle and use of consumables. *You may have noticed that I did not include [Darkmoon Card: Blue Dragon] in my gear breakdown. That is because, even with a theoretical proc rate of 2% over 250 seconds while casting back-to-back Chain Heals, the proc is highly mercurial and cannot be relied upon to proc during a meaningful time. There are instances when it doesn’t proc at all, or sometimes on the pull, or when you are already near mana cap, or during a period of downtime when you aren’t casting anyway, resulting in less overall MP5 than a [Mindtap Talisman]. For raid BIS across all tiers, check my Resto Shaman BIS list : The Egregious Guide to Wearing Pretty Purples. Resto Shaman concern themselves with three primary stats (Intellect, Stamina and Spirit) and three secondary stats (MP5, Healing Power (hSP) and Spell Crit). Typically, the primary stats and secondary stats are prioritized in that order. It is important in the early stages to pick up as many items as you can with MP5 since it is a rare and integral stat for the Resto Shaman. Mana that doesn’t get used is wasted. Accordingly, pure mana stats like MP5 rapidly lose value the more you have. This decline in the value of mana is exacerbated by the way hSP scales with downranked spells. The more hSP you have, the more efficient Chain Heal Rank 1 becomes relative to max rank. A well-geared Resto Shaman can use Rank 1 more often than an intro-geared Resto Shaman. The curious result is that a well-geared Shaman consumes less mana/sec while providing greater throughput. A common mistake many well-geared Shaman make is they take their newfound abundance of mana as an excuse to use fewer consumables. This choice saves gold but contributes nothing to your raid effectiveness. A Shaman who receives an MP5 upgrade only to cease using Dark Runes provides no additional value to his raid, only to his bank account. From the raid’s perspective, that item did not improve the Shaman at all and should have gone to someone else who could actually use the mana. Both Int and MP5 provide mana, but in opposite ways. Int provides a static amount of mana up front while MP5 contributes more and more mana the longer the fight goes on. Accordingly, the relative value of MP5 on any given encounter increases with the duration of that encounter. We can easily calculate the time it would take for MP5 to surpass a given amount of Int in terms of mana provided. If a given boss encounter is 5 minutes (300 seconds) long, how much Int is needed to provide the same mana as 1 MP5? Swap your gear around accordingly from fight to fight. Enables you to start using your mana consumables sooner. With a sizable pool of Intellect you can afford to use your consumables in a way that is more efficient. Relying on static mana from Int rather than a constant stream of mana from MP5 makes it easier and less stressful to get your consumable rotation exactly on point. In theory, crits add a lot of value to your heals. However, because of overhealing, this theoretical throughput is higher than reality. Overhealing disproportionately impacts larger heals, making crits especially vulnerable. One positive caveat for Resto Shaman is that the second and third bounces of Chain Heal are less likely to overheal, compensating somewhat for this downside of crit. One final point about crit: the talent Ancestral Healing. This armor buff is extremely important to keep up on the tanks. Thankfully Priests also provide this buff from their crit heals. Spirit is often underrated. Contrary to popular opinion, it has situational value for Resto Shaman. It provides a relatively large amount of regen, but only outside the 5 second rule. During periods of chain casting, Spirit contributes nothing to a Resto Shaman. Depending on the fight there may be more or less opportunity to spend time outside the 5 second rule. For a Resto Shaman, 10 Spirit provides 5 MP5 while not casting. That is huge. And you probably spend more time outside the 5 second rule than you think. Even on fights where you felt like you were chain casting the entire time, if you go back and watch a replay you will find moments where you got a tick or two of Spirit regen. Healing Equivalence Points (HEP) are a succinct way to interpret the value of the various stats on an item. The Equivalence Point (EP) system was created in remote antiquity by Ming, godfather of min/maxing, who wanted to more accurately prioritize gear in very minute ways. MP5 happens to be a unique stat in that its HEP value far outweighs its item budget. For this reason, I rank my HEP values against MP5. It is important to remember that these values are inexact. The exact value derived from each stat will vary from one week to the next, even on the same boss. I have found these numbers to be accurate in assessing which pieces of gear are actually worth picking up. Hands down, consumables are the most important preemptive measure to raiding a Resto Shaman can take. Hate them or love them, you aren’t bringing your full value to the raid without them. Your arsenal of consumables will impact your performance so greatly that you may as well be playing two Shaman. The items I listed above the line should be considered compulsory raid consumables. Some are more complex than others to farm but most of them should be no trouble at all. Yes, it is a long list but every one of these items can, and will, come in handy on some encounter so I suggest you stock up early. Scan the Auction House every day to try and catch consumables at their cheapest prices if you cannot farm them yourself… it’s a good money saver and you will need every bent copper for Naxxramas. Something you will have to get used to when transitioning from retail is dropping four totems every two minutes, or just simply dropping totems at all (*cough* retail). Yes, every two minutes! And one for your Mana Spring and Healing Stream totems. And say goodbye to Totemic Recall. If you are going to totem pull a mob/boss you'll have to drop a totem of the same element somewhere else or risk looking a fool. Totems are integral to the Shaman class and if you fail to drop them you are a bad Shaman. A common mistake many Shaman make is not refreshing their totems as they expire or as their party members out-range them. If you are new to the idea of placing buff sticks, your group can help you learn to refresh totems in a timely fashion and to manage their short range. I advise you to notify your group to spam a macro in party chat should they notice a cherished buff has fallen off. A buff-hungry melee DPSer will be all too eager to assist you in this way. A mistake a significant number of Shaman make is not to bind all of their necessary totems. Totem bindings are a required part of playing the Shaman class. There may be a moment where you have to swap from one totem to another rapidly or where there will be no time to open your spell book. Clicking them is not an option either. Every time you click a spell a kitten is brutally murdered. A further mistake many Shaman make is to neglect the benefit of casting non-melee totems while in a ranged DPS or healing group. This is a very serious lapse in judgment as there are several totems that can be worthwhile to a ranged DPS or healing party. Chief among these would be Tranquil Air Totem. Sometimes it can be worthwhile to swap quickly between totems of the same element, a tactic known as “totem twisting.” While demanding on both your mana pool and your attention span, this tactic can be particularly effective with Windfury Totem as it applies a 10 second buff that persists even if the totem is replaced. For example, if you find yourself with extra mana at the end of a fight you can twist between Windfury and Grace of Air to pump out some extra DPS from your group. Do it. Be the good you need in the world. Hero/10. Strength of Earth Totem – REQUIRED 100% uptime on this totem when in a melee group. Tremor Totem – An important totem to use when a boss encounter has fear/charm/sleep mechanics. Earthbind Totem – A very useful tool in kiting/running from loose trash in an instance. Stoneclaw Totem – Good to drop before Earthbind in order to take loose mobs off your tail. Stoneskin Totem – Not a very worthwhile totem. Use this if there are, for some reason, two Shaman in a melee or tank group. Frost Resistance Totem – Very beneficial to have down if you are a healer/ranged DPS group during Twin Emperors, Sapphiron or other encounters with Frost damage. Searing Totem – A nice addition to DPS race boss encounters and useful for snap-aggro on a boss with an aggro reset (Skeram, Noth, etc.). Fire Nova Totem – A nice addition to nuking adds on encounters such Anub’rekhan and Maexxna. Magma Totem – A nice addition to nuking adds/trash if you have the mana. 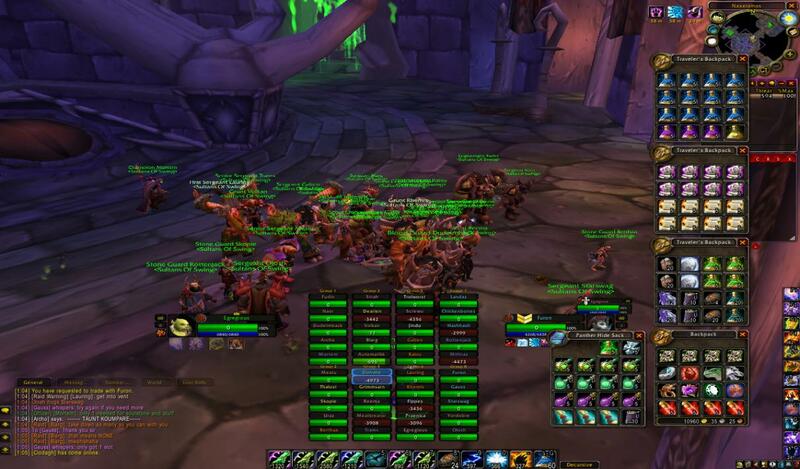 Windfury Totem – REQUIRED 100% uptime while in a melee DPS group. Exception: NR/TA Grace of Air Totem – A nice buff for a group with a Hunter or if you are one of two Shaman in a melee DPS group. Nature Resistance Totem – Very beneficial for fights involving high amounts of Nature damage. See Viscidus and Huhuran. Tranquil Air Totem – REQUIRED 100% uptime while in a healing or caster DPS group. Exception when NR is required. Grounding Totem – Useful for redirecting ranged attacks from susceptible mobs and bosses. Crucial in PvP. Mana Spring Totem – REQUIRED 100% uptime. Exception when FR is required. Mana Tide Totem – Use on rotation with Dark/Demonic Runes and Mana Potions. Poison Cleansing Totem – Mandatory on fights with high poison output (Viscidus, Huhuran, Grand Widow Faerlina and some Naxx trash). Fire Resistance Totem – Very beneficial for fights involving high amounts of Fire damage. Healing Stream Totem – Useful if there are two Shaman in one caster DPS/healer group. Disease Cleansing Totem – Nominal usage. But it’s Classic, you say, I can’t min/max professions? But you can, to a degree. Alchemy and Engineering can be viewed as raid viable professions for a healer. Alchemy gives you the power to bring your consumables in the form of herbs saving you bag space and allowing you to utilize one, or more, [Satchel of Cenarius], a 24 slot Herb bag. This effectively increases your overall inventory space if you craft your consumables on the go and gives you the unique ability to bring more than a standard player's arsenal to the raid. *Additive pro: It also prevents you from having to spend your day pestering people in Org to craft you this or that. *Additive pro: If a guild member isn’t online you don’t have to tip someone who would otherwise craft for you. Engineering is also uniquely raid viable since with it you can produce bombs, repair bots and pseudo-bandages. Things like Thorium Grenade or The Big One can be used to stun and damage mobs in challenging encounters where DPS can be an issue. On fights such as Maexxna a well timed The Big One can cause significant damage to the spiders that spawn before the web wrap. Consider this another tool in your arsenal. *Additive pro: Engineering is dually viable for PvP. You can amaze your friends with well timed grenades and irritate some of the big bad duelers outside your capital city. Fishing and Cooking are no-brainers. With these two professions you can kill time and earn a little extra gold on the side. Not to mention, you can farm those elusive Stonescale Eels that are so sought after for Flask of the Titans. *Additive pro: You can fish and cook your own Greater Sagefish Delight. *Additive pro: You can make a campfire for a nominal Spirit buff and amusement. A healer’s UI is crucial in adapting quickly to a fluid raid environment. It is equally important to have both a clear and “drama free” UI as well as a focally centered UI on your screen. Only you can know what is right for you but consider orienting your unit frames in the lower middle section of your screen. The advantages of this are a clear and unobstructed view of your raid, an unobstructed view of the ground you are standing on, and a central focus point for your eyes to rest upon while keeping the entire screen in your periphery. I find that visuals are always helpful. I apologize in advance for the quality, in those days my computer was not the greatest machine. In this video you can clearly see how much of the room I am able to view with my minimalist UI. All important information is displayed on my bars and superfluous keybinds and bars are hidden. Link: Have Consumables Gone Too Far? This SS also provides a sneak peek of what your consumables could look like in future progression encounters. Notice how the upper portion of my screen is unobstructed and I have a clear view of what is happening on either side of me. I believe–and this is not up for debate–it is very important to keep alert and raid aware, as well as cut down on potential avoidable damage taken. Addons can help you in this endeavor. I am going to start this off by saying that I cannot keybind for you… sadly. Only you know what suits you best. But here we go. Along with a proper UI, keybinds can greatly improve player reaction time and decrease wasted time when utilizing abilities. Keybinds also allow the player to subconsciously react to situations with muscle memory should their keybinds be formatted well. It is the goal of every great player to keybind all their important, and even some of their moderately important, abilities. When keybinding, keep this picture in mind. White: Signifies movement and utility keys. Green: Signifies keys that you can reach most quickly and most accurately. Orange: Signifies keys that are less efficient than Green. Red: Signifies keys that are hard to hit precisely. This means that your frequently used abilities should be bound to Green keys and the less frequently used the ability to the Brown or Red keys. Here is a list of Shaman abilities that you should consider keybinding. I will rank them in, what I consider, the order of importance for PvE. Please note that it is impossible to cluster spells in linear text. Know that I do not mean to suggest you start at 1 and bind to 5, then Q to R, etc in the order I have listed. Use your brain. Now to the fun part. Gameplay. There are two indistinct styles you can adopt as a Resto Shaman. MP5 over Healing Power or Healing Power over MP5. What it comes down to is what kind of epics you like to pick up and how good you are at managing your mana. If you do either of these “builds” correctly the difference will amount to almost nothing. If you chose to go for MP5 over healing, you will use higher ranked spells more often. If you chose to go for healing over MP5, you will use lower rank spells more often. The effect balances out and both are about the same. With the information I linked above, even spamming Chain Heal (Rank 1), you have the capability of pushing out insane throughput with one spell. With this knowledge, Chain Heal is even more of your go-to heal. It is important to never stop casting at all. If you find that you are casting at a target who is at full HP and all of the nearby players are as well, then cancel your cast and queue up another heal. But always keep casting. This is why you have your arsenal of consumables. Resto Shaman are a key player in healing the tanks and melee. We may not be as efficient or powerful as a Druid or Priest for direct tank healing, but with our CH we can do both effective tank and melee healing. Additionally, our spell critical strikes have a chance to grant Ancestral Healing. We can add a steady stream of anywhere between 1,000 and 1,400 (depending on the CH rank and player’s hSP) to the tank every 2.5 seconds. The goal of CH spamming is to use about this breakdown of ranks: CH(R1) 60%, CH(R2) 20%, and CH(R3)20%. With proper itemization and consumable usage this should be well within the reach of a Shaman in MC/BWL gear. CH(R2) costs 52 mana more and can hit for 100~ more than a R1. R3 is a little more expensive but, if timed correctly, is extremely handy in AoE raid healing scenarios. It comes down to if you can afford it, cast it. This style of play involves an acute knowledge of one’s mana consumption, encounter time and resource usage. Without these three factors, it can be easy to run yourself out of mana far before the fight is over, rendering you useless or forcing you to steal an Innervate from another player. A good Shaman should rarely ask for an Innervate –though it’s always nice to receive one. The goal of any healer is to use all of their consumables effectively and be as close to OOM as possible at the end of an encounter. Any extra mana at the end of a fight can be viewed as either loss of possible healing or effective overhealing. Both are bad, though overhealing less so. CH is, in its purest form, your main heal. You will use it to heal tanks, melee and ranged. Although this is the case, do not mindlessly spam CH. Think about what kind of mechanics the boss has and where your CH will be most valuable. Pre-cast on melee members when AoE damage is going out. Use it on tanks if a proximity based AoE is about to be dropped onto the floor, this will allow you to both heal the tank and the melee. A good example is on the Snake boss in ZG. After the 50% transition into Phase 2 you should start -after waiting for your tank to reestablish threat- casting CH R2-3 on the tank to both keep him alive as well as sustain the melee who will be taking damage from his AoE poison ability and the ground mounds. Even though CH is your definitive best friend, you should be aware of situations that call for your other healing spells. This is your slow, big single target heal. Basically, a tank heal. The benefit of this spell is that it applies a talented buff called Healing Way. Healing Way can stack to 3/3 and increases your consecutive HW (not LHW) spells on that target. It is a useful tool when tank healing on encounters such as Chromaggus, Ragnaros, Baron Geddon, Anub'Rekhan, Maexxna and all other encounters that require you, as a Shaman, to directly heal the tank. Utilizing HW can be a challenge as it is not particularly mana efficient. This means that you will need to have several ranks on your bar (see my KEYBINDS section). A low, mid and high output HW is ideal as it covers the entire span of possible tank damage taken. When considering what ranks to chose it is important to know how the spell coefficient works. The longer a spell, the higher bonus you will add with your hSP. This means that, when you choose shorter cast time HWs, the spell coefficient will receive less than the longer duration heals in terms of bonus healing. Talenting into Improved Healing Wave does not reduce the coefficient. So, with that in mind, keep your low to mid range HW at R4 or above as that is the level where the coefficient is at its maximum. Using HW is a good practice to start when there is little damage going out on the raid. This is because typically, when Blizzard decides for there to be less raid damage, there is an increase in Tank damage. So, if you know raidwide damage is about to dip, top off your raid and then begin casting HW on your tank to help with the overall healing. Again, as I said in the CH section, there is no real reason to ever stop casting as someone is always going to be taking damage. One mark of a great Shaman is keeping Ancestral Healing up on the Main Tank and as many other OT as possible. On fights with heavy tank damage, a clever Shaman can pop off a HW(R1) every 14 seconds to both refresh their Healing Way stacks and a chance to proc AH. With the utilization of Vallen’s ClassicMouseoverMacros, your target frame functionality can now be used as a handy focus frame. If you keep that directed at your tank all the time you will be able to see whether or not the Ancestral Healing or Inspiration (the Priest AH equiv) is active. If not, try to proc one. A good fallback is just to spam your tank with CH until it procs. That method of healing will result in less overall healing than a Shaman who spams CHr1 consecutively. However, if your raid has problems with tank healing, this method of healing is particularly beneficial. The Flash Heal and Healing Touch (R3) of the Resto Shaman. Using LHW effectively can be challenging. Since it does not benefit greatly from the coefficient–it has a very short cast–it will be the weakest spell in your arsenal. However, short of NS HW R10, it is also your fastest heal. There are a maximum of three scenarios where casting LHW is viable. You, your tank, or another raid member is about to die and they need healing ASAP–and your NS is on CD. Your raid is spread out in a manner that renders CH ineffective. Your tank is taking large damage and neither Inspiration nor Ancestral Healing are active; therefore, you must proc Ancestral Healing ASAP. In these three situations casting LHW becomes the prudent option. Fights where LHW can be a handy option are on: Chromaggus during a Time Lapse, Nefarian if the Curse is not being dispelled, Skeram, Sartura, Twin Emperors, C’Thun and so on. Whenever you need to do quick healing in anticipation of follow up damage or quickly get someone in the raid a couple more health points, LHW is the way to go. Ostensibly, if the boss encounter does not warrant intensive healing, adhering to a consumable rotation will be of less importance and you can just wing it. The key is to continue to use your mana consumables off CD in order to keep your mana up at as high a level as possible throughout every encounter. A lapse or two could leave you near OOM in the middle of a fight or during a critical period of raid damage. Also, it is crucial that you have a good view of your mana consumables (Mana Tide, Major Mana Potion, Dark/Demonic Rune) somewhere on your action bar. You must be aware of when they come off CD and use them immediately. It is very easy to get swept up in the healing required to save people’s lives but it is even more important that you drink that pot. And the good news is they are off the GCD so you can quickly down them and continue healing without having to wait 1.5 seconds. NS is a valuable tool; one of our two CDs aside from Mana Tide Totem. However, it isn't as big of a deal as we would like. There are 2 methods you can make use of when approaching NS. 1) the selfless healer method where you hold NS for an emergency, and 2) the selfish healer method where you use it off CD for raw healing throughput. There is really no right or wrong way to utilize the spell as, either way, you are correcting health deficits within the raid. The only advice I can offer is to be cautious when first entering a guild/group of players. Get to know them, their tendencies and strengths and weaknesses. Then you can decide what is and what is not a good way to use NS. Another small thing which will drastically improve your performance and reaction time is to download KLH Threat Meter. Use this as a tool to monitor who is, and who is not, high on threat in order to be ready with appropriate healing should there be a: tank switch, loss of aggro, or an Ignite Mage about to explode onto the tanking scene. Utilizing KLH is an easy and surefire way to not only up your performance but also increase your player awareness. The more things that you force yourself to keep track of, the easier it will be to maintain that level of concentration in the future and the easier encounters will begin to feel for you. In essence, the more you train the better you will become. Finally, know your boss fights. The more you know about boss mechanics the more you can predict player specific or raid wide damage. A good healer is up-to-date on boss strategies and looks for raid-group specific damage. They are aware of the player here who takes more “I stood in the fire” damage or the player there who always wants to pop off that last bit of their rotation before moving out of avoidable damage. This more than anything is what can truly make you a great player: the ability to anticipate where healing is needed. BigWigs or DBM really help in accelerating the learning curve on each boss. Use them and use your brain when healing. For god’s sake, do NOT tunnel vision your UI. Take your eyes off every few seconds and quickly scan the raid. Is the tank re-positioning? Are DPS running around like the idiots they are? Is someone about to be struck by avoidable damage? These are questions you should always be asking yourself. Chain Heal is your go-to heal in terms of both tank and raid healing. Prioritize healing melee members of your raid when AoE hits as that is where your healing is most effective. Let the Priests and Druids heal the ranged, especially if they aren't grouped. Then, once the melee are taken care of, you can assist with the rest of the raid. Lesser Healing Wave will be your primary choice when the raid is not appropriately positioned for you to make full use of CH. Instead, use LHW to shoot out quick heals to members in your raid who are in desperate need of healing. This is a useful tool when used judiciously. Do not get it into your head that you are a Druid and try to Healing Touch your way to glory. A good time for LHW R6 spam is on Chromaggus during a Time Lapse. Healing Wave is going to be one of those spells that you only use if you know there will be significant tank damage and low raid damage. If there is even a question as to whether or not the melee will take damage, default to Chain Heal. But, if you know it will only be tank damage (IE Chromaggus or Loatheb), you can utilize Healing Wave. Use R1 before the fight initiates to quickly stack up 3 Healing Way then swap to R4 or 5 (whatever your mana can sustain) and heal with that during moderate damage. If the tank will take heavy damage swap to R7 or 10 and keep it up as long as necessary. When to use Nature's Swiftness? This is challenging because you can hold it for when a raid member needs immediate, big healing and combo it with HWR10 for a ~3,000+ heal or you can use it selfishly for throughput off CD paired with CH. It is really up to you. If you want to feel/be more of a clutch healer then save NS for an emergency. If you want to do a little more healing on the charts then bust that thing whenever you can and CHr3 into the raid. Be raid aware. Learn the fights and learn when and where to accurately apply your healing. This is the most important thing needed to transition from a good or average healer to a great healer. And if all else fails, you can always just mindlessly spam CH.